Getting answers from third-party experts usually costs good, hard money. Sites like Quora, LinkedIn Answers, and Fluther remove this painand let you get the answers to things for which Google just isn't going to give good results. If I actually want to know about search engine optimization (SEO), for example, I'll ask an answer site before Google because of the spammy results I'd get out of Google from that query. The same goes for any product you're thinking of purchasing including software or a Web service. Answer sites can give solid, unfiltered feedback from other real people rather than from marketing machines. Earlier this year, I set up a profile on Quora, a site purpose-built for you to ask and answer questions. Being a writer, I'm in the business of answering people's questions, and a good way to get ideas for articles is to see what people want answers for. I was impressed with the people who turned out to answer questions--often high-ranking experts in their fields, with excellent, succinct answers. Answer sites are nothing new. Yahoo Answers has been around for years, but it's been doing nothing more than clogging up search results in Google with nonsensical twaddle. Quora's model is attractive in that it attracts higher caliber answers than what you normally find from an anonymous "yahoo". "Does your business use time management software for keeping track of hours employees spend on projects? If you do, which package would you recommend? I'm looking for packages for small to medium-size businesses rather than an enterprise solution." I started with Quora since it seemed to have the most potential. I tagged my question in the appropriate areas and fed it into the wild, checking back on the status of the answers throughout the day. I figured it would take a day or two to get some responses. Instead, my question and got tagged as a survey question either by Quora itself or by a Quora user, as the image below shows. That reads as a giant stake in the heart of the theory that Quora could be useful for answering the kind of questions business owners are likely to ask. Such questions are apparently anathema on Quora, and also likely go a long way towards helping to fight both question and answer spam. So if you have a very detailed question, ensure that it doesn't address the user directly or ask for multiple responses, and you can put it on Quora. This isn't necessarily a bad policy, but if a business wants a question answered quickly, Quora clearly is not the solution. I asked the exact same question on LinkedIn's Answers section. This was clearly where the people I was hoping to meet were, judging from the 10 remarkably well thought-out and helpful responses my question got. 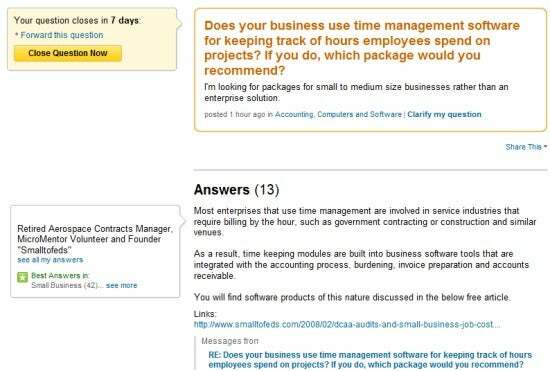 While roughly half were clearly from the purveyors of various time-management software, a few extremely helpful entries came from people who had been using the software in question. In the end I checked out Active Collab, Basecamp, and Paprika based on the recommendations that I got from LinkedIn Answers. Next page: Fluther...and the best answers to my question?